I have a serious love of parties: the planning, the decorations, the food. But, what I don't love is trying to figure out party favors. Ever since Pinterest exploded onto the scene, it seems that giving a party favor is the thing to do. Is it rude to not give one? I literally have no idea, but with so many good ideas on Pinterest, you start to feel like if you want to be a hostess with the most-ess, party favors for your guests are a must. As a party hostess, you already have a lot on your plate and feel stretched in your budget. If you are like me, you don't want to spend a lot of time or money on your party favors, but you still want them to be thoughtful and memorable. 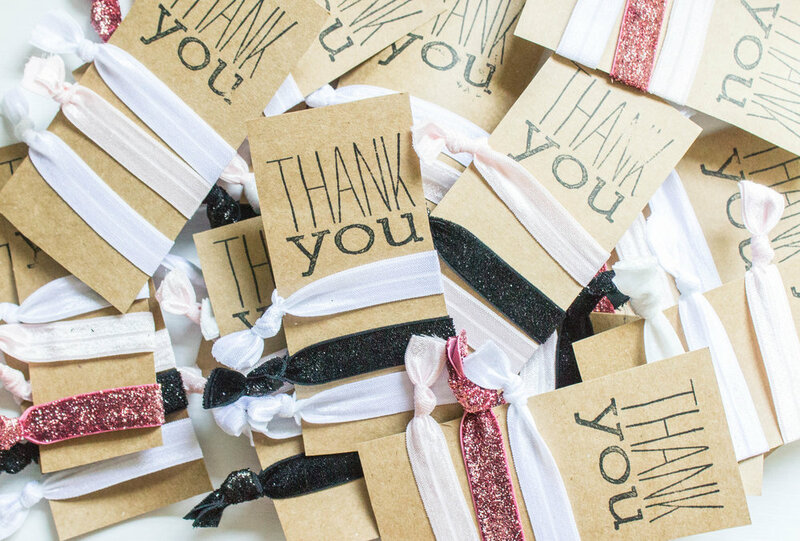 Today, I'm sharing with you the easiest, most cost-effective party favor that will have a lasting impression. This gift can be used for wedding showers, baby showers, or if you're like me, given to the guests of a Lipsense party. My hostess for my party was gracious enough to open her home to me and all her friends and allow me the opportunity to share my love of makeup, so the least I could do was thank all her guests with a cute gift for showing up and listening to me! I gave each girl a bag with candy and these DIY ponytail holders. All of the materials you need can be found at Hobby Lobby. Just make sure you get everything on sale! Sales at Hobby Lobby change weekly, so basically if its not on sale this week, chances are it will be on sale next week. They also offer a 40% coupon everyday on a single full priced item, so make sure you download the Hobby Lobby app! -2-3 rolls of fold over elastic trim (in the ribbon section)- $2.99 make sure its stretchy!! Assuming you buy everything on sale, and this is a one time event, like a shower, your cost would be around $1.00 per person. If this is a reoccuring project, for instance if you are like me and sell lipsense, then the stamps and cardstock can be used over and over. The only thing you will have to replace will be the ribbon, then your cost is around $.45 per person for each party. 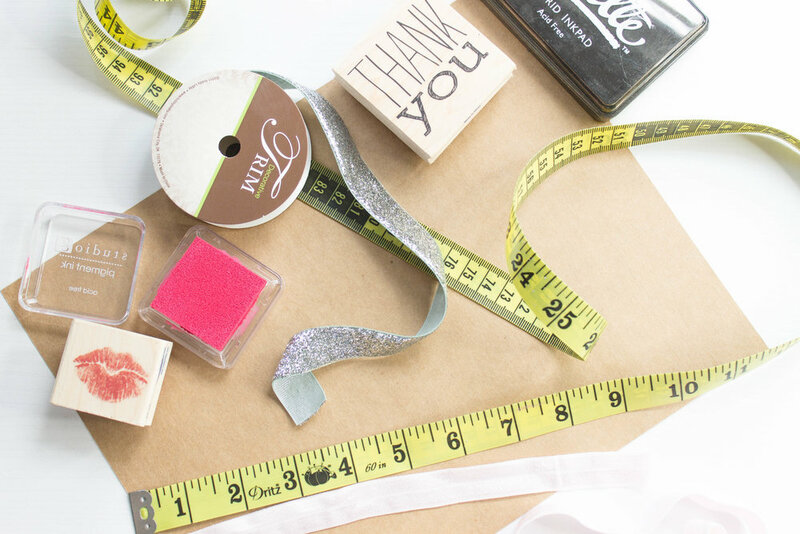 After gathering all your materials, you'll want to cut your ribbon a little over double the length you want them to be. For instance, I wanted my hair-ties to be around 4 inches so I cut my ribbon at around 8 1/2 inches. After cutting your ribbon, simply tie a not and slide onto a rectangularly cut piece of cardstock. Add a stamped message for an extra touch. Lastly, you'll want to personalize your gift bag. Anyone can give you a regular bag. Remember, it's all about the details so get creative! 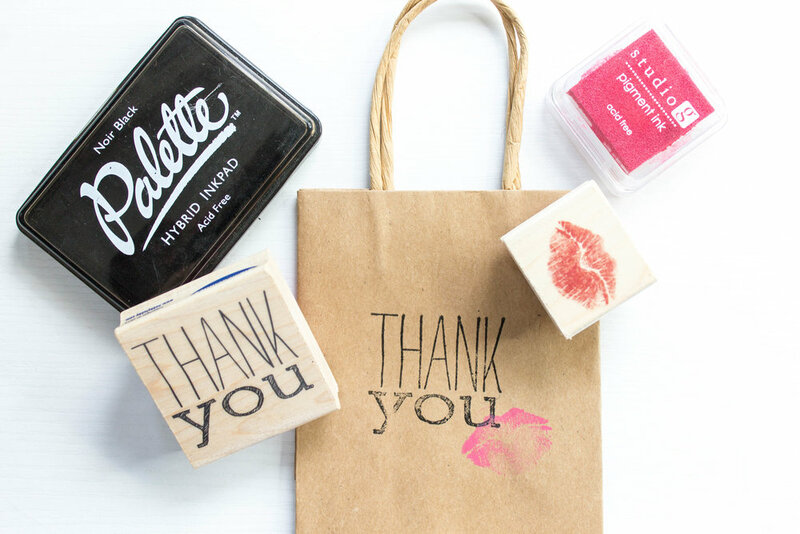 Since my bags were for a Lipsense Party, I stamped mine with a thank-you and lips. Finish up by throwing in your hair-ties, a handful of chocolates or mints, a business card if it's for a direct sales party, and top with cute tissue paper. Since the bags are small I used half a sheet of tissue paper for each bag. If you want to know more about my Lipsense Business head to my Instagram @roselipcompany or my Facebook page www.facebook.com/groups/roselipco/.